Populism or systemic reforms: what candidates for the President of Ukraine promise? 2018 was accompanied by constant political turbulence, which in fact became a systemic phenomenon in Ukrainian politics. There was no serious breakthrough in structural reforms, but some point changes were managed to realize. 2019 will be marked by the elections. The parade of candidates will increase political uncertainty in the first half of the year. Structural reforms will go to the background, at least until the end of the entire election period. Any qualitative changes in all the hot issues of internal politics will be possible only after the parliamentary elections, but the vector of these changes is difficult to predict, as Ukraine once again finds itself at a crossroads. Achievements and failures of 2018 The achievements of the Ukrainian authorities in 2018 include: 1. Preservation of authorities` efficiency. Presidential Administration, BPP and NF managed to preserve the existing political structure and provide the opportunity to make decisions. However, the crisis in the relations between BPP and NF is deepened, and, besides finding allies for important voting, these parties spend a lot of time to coordinate positions between them. It is increasingly difficult for the president to keep his own agenda in parliament. Parliament, though with difficulty, but continues to adopt government laws, the government works without much shocks and stupor. The duality of the executive branch though intensifies the relationship between the president and the prime minister, but does not lead to catastrophic conflicts between them. 2. Continued implementation of reforms. In 2018, the implementation of decentralization, health-care and education reforms continued. The decentralization reform is the most successful, as evidenced by the dynamics of the creation of new UTCs and the increase of local budgets. As for the implementation of the health-care reform, the transition to a family doctor system has started and it has results in the form of millions of signed declarations of citizens with doctors, but real changes are still poorly felt. Some family doctors began to receive new wages. The reform of education system has more problems, in particular through realization at local level, but its implementation continues. In addition, Ukrainian politicians finally managed to adopt the law on the anti-corruption court, the formation of which will allow continuation of the implementation of anti-corruption reform. However, one should understand that its adoption is largely the merit of international partners of Ukraine and the public sector, rather than the representatives of the authorities themselves. It is also possible to note the adoption of the law on privatization, which, according to the people's deputies' plan, should create transparent and understandable conditions for privatization in Ukraine. However, the law has been adopted, but the privatization itself has not actually been carried out. Finally, the launch of the SBI, however, was accompanied by numerous scandals. 3. Preservation of cooperation between Ukraine and IMF. Given the high debt burden on the budget of Ukraine, as well as the fragile financial stability of Ukraine, it is important to conclude a new program of cooperation between Ukraine and IMF. Ukraine is planning to receive the first tranche in 2018, subject to a positive decision by the IMF Board of Directors on December 18 this year. It should also be emphasized that the conditions of cooperation between Ukraine and IMF act as a basis (main driver) for carrying out structural reforms. In addition, continued cooperation between Ukraine and IMF automatically expands the list of potential sources for attraction of funds on foreign markets by Ukraine. The failures of the Ukrainian authorities in 2018 include: 1. The low quality of democracy, the strengthening of anti-liberal tendencies. Despite a certain weakening of the president's position, he continues to monopolize the power in his hands. Formally, while not belonging to any of the branches of government, due to the exclusive influence on the GPU and the SSU, the informal mechanisms of personal commitments, as well as the largest faction in the parliament, president Poroshenko has an exclusive influence both on the government and parliament, and on the judicial branch, which, after judicial reform, actually came out under the influence of the Verkhovna Rada. Currently, there is practically no criticism of the president among the Ukrainian media, and the authorities' attacks on media have increased, which allow criticism of the current president. Pressure on journalists and representatives of civil society organizations (the use of physical violence against them) by law enforcement agencies and various “titushki”, as well as representatives of nationalist movements, became a common phenomenon. Against the background of increasing the role of representatives of the public sector in state-building processes, the opposition of the authorities to this trend increases proportionally. Representatives of the authorities continue to use fake or manual NGOs, which are members of the supervisory boards of state bodies. There were frequent cases of open hostility between government officials and civil organizations and activists. An apogee in 2018 was the murder of activist Kateryna Gandzyuk and the apparent sabotage of the crime investigation process by law enforcement agencies. There are numerous attacks on activists in the regions. 2. Critical politicization of the work of state authorities. In terms of the pre-election year, voting in the parliament was more like election campaigning than real legislative work. The pressure on political forces by opening criminal cases on separate deputies, holding dirty PR campaigns to discredit political opponents, etc., became merely common. All this has a very negative effect on the institutional capacity of the entire state machinery. The distrust of citizens towards state authorities is critical. The GPU, the SSU, the Ministry of Internal Affairs, and recently SAP and NABU are used in Ukraine as institutes of political competition; in most cases the law enforcement function is secondary to them. 3. Security situation. Today, the level of insecurity among Ukrainian citizens is the largest in the history of Ukraine's independence. The streets of the Ukrainian capital and other cities are no longer safe for politicians, businessmen, journalists, ordinary citizens. The security issue is being actualized not so much in the context of the war in the East, but in increasing the number of publicly commissioned murders, gang raids, terrorist attacks, and explosions of military warehouses in the deep rear. The level of security in Ukraine is approaching a threatening level, when the state actually becomes unable to meet the basic needs of society, which in the end can lead to the destruction of statehood. 4. The war in Donbas and Crimea. In 2018, the issue of de-occupation of non-controlled territories did not have any positive dynamics. This concerns not only the actual issue of the return of the temporarily occupied territories, but also the question of establishing a strategy for the gradual reintegration of these areas, ensuring the rights (in particular electoral) of IDPs and implementing their social guarantees. The authorities are actively using Russian aggression for internal political use in order to receive electoral dividends during future elections. 5. Lack of results in the fight against corruption. Despite the fact that almost all the necessary anti-corruption infrastructure was established before 2018, these authorities continue to demonstrate the lack of real results in the fight against corruption. The reason for this is, first of all, the political engagement of anti-corruption bodies, which increasingly play along with the authorities, in particular Presidential Administration and less engaged in a real fight against corruption. Also, the conflict between NABU and SAP, GPU, Security Service of Ukraine and Ministry of Internal Affairs, also has a negative impact on the actual result of the anti-corruption policy and law-enforcement system as a whole.In addition, the SSU has not lost its non-specific functions of combating corruption, which requires business, public sector and international partners of Ukraine. Also at the stage of creation of the High Anti-Corruption Court there was a series of attempts on the part of the authorities to gain control over this anti-corruption institution. Positions of the main political players The president has lost some of his influence, but continues to be a figure №1. Yulia Tymoshenko is gaining strength, who, with her political strength, is firmly entrenched in the first place in political ratings. Narodnyi Front is increasingly moving away from Poroshenko, trying to build his own game, looking for new allies and new playback formats in power.The white and blue camp ends the year with a split day of "Opposition bloc", where "gasovyky" and "akhmetivtsi" can not agree on the candidature of a single candidate for president. The liberal-democratic opposition was not able to unite and goes to elections in different columns, headed by Sadovy and Grytsenko.There was also no complete consolidation in the nationalist camp, from which Ruslan Koshulynsky and “Svoboda” and Andriy Biletsky “National Corps” run for the presidency. Yulia Tymoshenko and “Batkivshchyna”. Yulia Tymoshenko started her unofficial presidential campaign in the beginning of summer. She was the first who announced her intention to run for the presidency and introduced her program "New course". She and her political force are now the leaders of all sociological ratings According to the latest sociological research conducted by the Kyiv International Institute of Sociology among Ukrainians, who decided to vote, 21.2% are ready to vote for Yulia Tymoshenko, 23.4% - for the All-Ukrainian Association “Batkivshchyna”. Tymoshenko is always open to the search for new allies. Today, her allies include Valentyn Nalyvaichenko and his party “Spravedlyvist”, as well as Sergiy Taruta and his “Osnova” party. She establishes a dialogue with the leaders of the “Narodnyi Front”. And given not very attractive prospects for this party (its rating according to the latest results of social surveys is 0.2%), parliamentary deputies are often seen next to Tymoshenko's office. It's no secret that there is a good communication between Lady Yu and Arsen Avakov. His control of the security forces in the country can be useful while protecting election results. Friendship with the NF can be observed in her proposals for limiting the president's powers and turning Ukraine into a parliamentary republic, as previously stated by the "veterans". Also, recently, Yulia Tymoshenko stated that she is ready to cooperate with “Samopomich” party, Svyatoslav Vakarchuk, if he goes to politics and Anatoly Grytsenko. Petro Poroshenko and BPP. The current president, Petro Poroshenko, has not officially announced his intentions to run for presidency, and promised to do it after the start of the election campaign. And he has something to think about. Low electoral support and humiliating ratings still open up to him insignificant prospects and uncomfortable electoral position. Of course, now he can not state that he is not going to the next elections, because he will immediately lose all his influence on decision-making in the country. Therefore, he is now actively demonstrating full readiness and positioning himself the only possible candidate from the authorities. Also, Petro Poroshenko is attempting to postpone the presidential elections or even unite their holding with parliamentary elections, which could give him the opportunity to preserve immunity, if not presidential, then at least get a deputy one. The president builds his pre-election rhetoric with the slogans: “Army. Language. Faith.”, “We Go Our Way,” “Get Away From Moscow.” However, such a rhetoric does not receive a special response from the public, as evidenced by the latest sociological data that records the support of the current president at 11.6% (among those who have been decided to vote), and 11.2% of the country's population support his party. Despite the third place in the rating, Poroshenko has a chance to go to the second round, but it will be very difficult to win because according to sociological research, he will lose to all his possible opponents. Although not everything is so simple. Once the closest companion, “one`s” prime minister, Volodymyr Groysman, shows more independence. First, he has his own political ambitions, and secondly, after a long conversation and bidding, he didn't want to lead the presidential political force and sit in the same boat with the president's team, and thirdly, he establishes close ties and looks for partners with other political forces, including Arseniy Yatsenyuk and Narodnyi Front. All this leads to the thought that there may be a serious split within the authorities. “Narodnyy front”. The recent appearance of Arseniy Yatsenyuk on billboards showed that the former prime minister apparently had forgotten about his complete fiasco in the government and also dreams of returning to the political Olympus. The tensions in his relationship with the president became especially noticeable. After all, the BPP and the NF don’t have a particular ideological difference, so Yatsenyuk, albeit with a poor rating, will still take away the president's electorate. The NF leader is clearly going to take over the pre-election campaign agenda of Poroshenko because Yatsenyuk's new advertisement sarcastically interprets the main pre-election slogans of the president. At present, the disparity of the faction is intensifying, various groups of influence in the party are actively looking for ways to play in power, picking up allies. It is likely that the NF will participate in the elections as different columns within political organizations. As of today, the NF has a part of the administrative resources, which the main applicants for power in the country want to get. Liberal-Democratic Powers. The union of liberal-democratic forces, which their leaders have been talking for so long, didn’t happen. A few months ago, the most recognizable of them - the head of "Hromadyanska pozytsiya" Anatoliy Hrytsenko, mayor of Lviv and leader of the "Samopomich" Andriy Sadovy, as well as people's deputy and the head of “Narodnyy kontrol” party Dmytro Dobrodomov publicly called on to leave personal political ambitions and unite. The first one to leave “the ship” was Sadovyy. He announced that he would run for the presidency and united with the “Democratic Alliance” political party of Vasyl Gatsko. Dmytro Dobrodomov also announced the intention to strive for the presidential post. Grytsenko, after unsuccessful attempt to create a joint platform with Dobrodomov, united efforts on presidential and parliamentary elections with the leader of the "Hromadskyy rukh "Khvylya" Viktor Chumak, who headed his election headquarters. 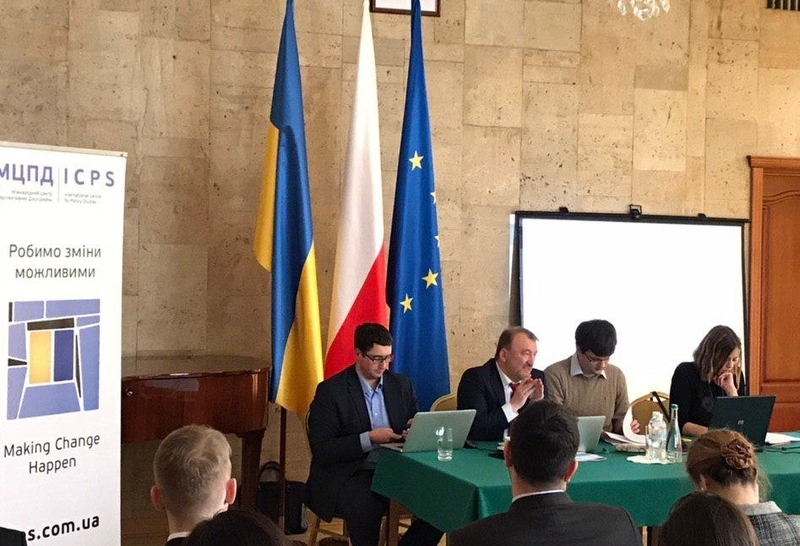 Mykola Tomenko, leader of the "Ridna krayina" party and leader of the "European Party" Mykola Katerenchuk also expressed support for Anatoliy Hrytsenko as a candidate for president of Ukraine. 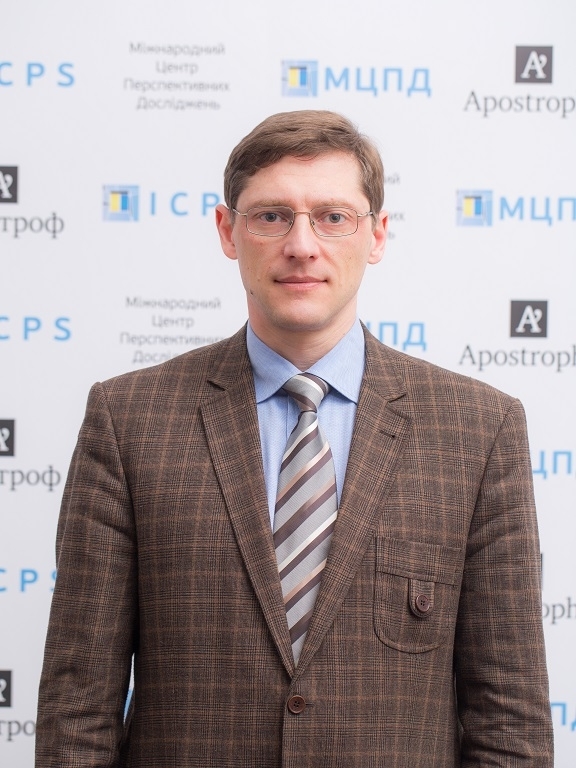 Anatoliy Hrytsenko has the highest rating in this camp, who are ready to support 8.2% (among those who already determined their choice) of voters, and 9.1% of Ukrainian citizens are ready to vote for his "Hromadyanska pozytsiya". 2.2% of voters are ready to vote for Andriy Sadovy, 3.6% for the "Samopomich" Association". 0.5% are ready to support Dmytro Dobrodomov, and 0.4% - his party “Narodnyy kontrol”. There will be no special differences in their programs, although they position themselves differently. According to Sadovy, key elements of his campaign will be "mobilization of young people, breaking the corruptive esprit de corps in politics and technological modernization of the country". Grytsenko’s campaign will be based on several key statements: legality, order, responsibility, honesty. Dobrodomov positions himself as an outspoken fighter against corruption. “Opposition block”. In the white-and-blue camp, a very difficult situation arose - the split between the two main groups of the party's influence, which had previously been conflicting, but never brought the opposition into the public plane. 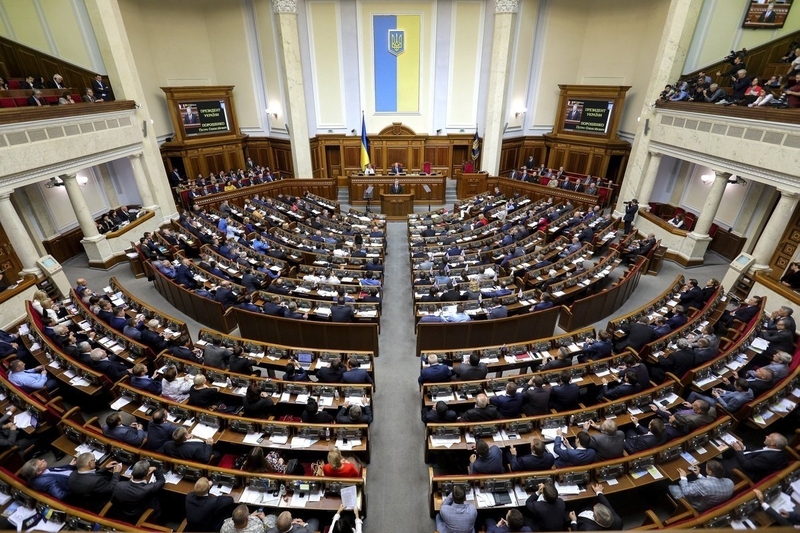 As a result, Yuriy Boyko and Serhiy Lyovochkin were expelled from the OB faction in the Verkhovna Rada, while Vadym Novinsky became the head of the faction. After that, Boyko and Lyovochkin created a separate parliamentary group in the parliament - "Opposition platform - For life". That is, in this field, we have two main centres of influence: the first one is represented by the so-called "Akhmetovs" (Akhmetov, Novinsky, Kolesnikov), and the second by the so-called "gasmen" and "pro-Russian politicians" - Boyko, Levochkin, Firtash, Medvedchuk and Rabinovich. At the moment, these two groups are leading a struggle for control over the "Opposition block". This confrontation doesn’t give political dividends, but only leads to the dispersal of the electorate and obviously complicates the chances of passing their candidates to the second round of the presidential election. It is likely that, both in the presidential and parliamentary elections, these politicians will move as two, separate and quarrelling with each other, columns. Nationalist powers. Ukrainian nationalists failed to unite. "Natsionalnyy korpus" decided not to support a compromise figure from the rest of nationalist organizations Ruslan Koshulinsky, a representative of the "The All-Ukrainian Union "Svoboda". Thus, Andriy Biletsky announced his independent campaign for the presidential election. According to the latest sociological research, Ukrainian nationalists don't have much support among Ukrainians. As follows, currently, Koshulinsky can count on the support of 0.9% of Ukrainian voters, and Biletsky - of 0.4%. The political party "VO "Svoboda" today has support in 2.2% of voters, and "Natsionalnyy korpus" - 0.6%. Most likely, Ukrainian nationalists will play the role of "violence traffickers", which will be used to pressure certain candidates or even to break the election in a particular district. The Jokers of Ukrainian politics. Ukrainian showman Vladimir Zelensky continues to increase his rating. According to the latest sociological research, he ranked second, 14.6% of voters (among those who already determined their choice) are ready to vote for him, and 13% for his political party "Servant of the people". And this despite the fact that Zelensky didn’t confirm his intention to participate. Interest in Zelensky as a presidential candidate was well-heated in the run-up to the election of a new part of the popular TV series "Servant of the people", where, according to the scenario, a simple teacher Vasyl Goloborodko, performed by Volodymyr Zelensky, receives the power in Ukraine. The series very successfully shows the real state of affairs in Ukrainian politics and prompts Ukrainians to vote for a non-systemic candidate - a simple guy from the people who is fed up with corruption, injustice, poverty, and who seeks to change everything by joining the struggle with the Ukrainian oligarchs. In fact, Ukrainians want to vote not so much for Zelensky, but for the image created by him in the series. His electorate is people, deeply disappointed with the classic politicians, who seek for the way to break the vicious circle of esprit de corps in Ukraine. However, when Zelensky will begin to speak political language, making the relevant statements and offering his options for solving the problems of our state, it's unlikely that his rating, will remain the same or will keep growing. Given the proximity of Zelensky to the oligarch Igor Kolomoisky, who in return supports Yulia Tymoshenko, there is a likelihood of Zelensky's refusal to take part in the presidential race. Nevertheless, we will most likely see his party in the election ballot at parliamentary elections. The rating of the musician Svyatoslav Vakarchuk "subsided" essentially: from the top three he moved to the 9th position with the assets of 3.8% of voters (among those who already determined their choice), essentially "subsided". Obviously, his electorate was tired of waiting for him to confirm his participation in the presidential election and began to consider alternative options. It is believed that Vakarchuk could become a reserve option for Poroshenko by “giving the way”, but at the same time he will solely run for parliamentary elections within “Vakarchuk block”. But such a variant may be beneficial for the current president only in the case of simultaneous holding of presidential and parliamentary elections. Perhaps a military state will be able to help Poroshenko in this "special operation". It is also worth noting that so-called “Vakarchuk block” can count on only 4.1% of the support of Ukrainian voters. There is a high probability that the 2019 elections will be a battle of jokers. Under these conditions, we will have Vakarchuk and Zelensky in the second round, however, behind their backs one can see quite familiar oligarchic silhouettes. General forecast of the situation The defining trend for 2019 will be presidential elections and the further domestic development of Ukraine's political will depend on how they will be held. Accordingly, we distinguish three baseline scenarios. The first scenario (pessimistic). Failure of the election process, destabilization, Maidan 3.0. In this scenario, Ukraine faces great political instability, massive mass protests and a high probability of street violence. In such a situation, our country will be on the verge of entering the category of "failed state". There is a high probability that Russia will want to use such a state of affairs, and will be able to at least expand its zone of effective control or even occupate; as a maximum, it will carry out a military sweep of the country and ultimately return Ukraine to its womb. The other side of this scenario could become an adoption of authoritarian power in Ukraine by the current authorities. Second scenario (basic). Presidential elections will take place, but they will be accompanied by an active use of violence and a debate on the recognition or non-recognition of their results both inside the country and abroad (other states). A similar situation will be repeated in parliamentary elections. The confidence in the state bodies thus formed will be low, the decision-making process is complicated, but in general, the institutional capacity of the state will be at a more or less acceptable level, although the implementation of structural reforms will be complicated by a high level of political conflict. The third scenario (optimistic). Presidential elections will take place in a civilized way. The transfer of power (or its preservation under the current president) will take place under all democratic procedures. 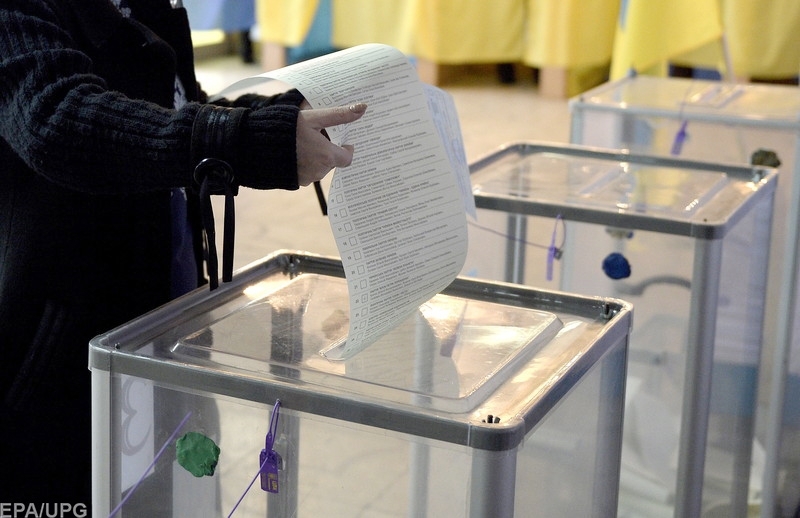 Parliamentary elections will be held democratically and without systemic violations. And by the end of the year, Ukraine will have a legitimate president, a parliament and a government that can effectively carry out structural reforms and develop the country. Of course, political conflict will remain, but in such a scenario, it will be at a minimal level and will not constitute a serious threat. In any case, the results of the presidential election will have a decisive influence on parliamentary races. The latter will determine the political life in the second half of 2019. The situation is complicated by the fact that it is almost impossible to foresee parliamentary elections. First, because of the uncertainty of the election results of the head of state, and secondly, due to the large number of political forces and the small electoral gap between them. The results of the presidential elections structure the political field, promote the formation of new political alliances and the crystallization of political forces through the power opposition. Given the victory of Yulia Tymoshenko, there is an option to hold a constitutional assembly, which will turn Ukraine into a parliamentary republic of the chancellor type. For this, Tymoshenko will have to initiate an all-Ukrainian referendum, which legitimizes her plan and will launch a radical change in the system of public administration in the country. Under such a scenario, it is possible to postpone parliamentary elections at a later time after the referendum, and then the price of such elections will be very high, since the whole power of power in the country will stand on the horse. It should be noted that constitutional changes to simplify the president's position and the introduction of a parliamentary republic are supported by most of the NF. In addition, the transformation of Ukraine into a parliamentary republic may also be beneficial to the political forces of the white-and-blue camp. To prevent such a course of events may be a significant political turbulence, the economic crisis, as well as the peak period of payments for external borrowing. A separate issue that deserves attention is the relationship between the president (old / new) and the government in the period after the presidential and parliamentary elections. The fact is that, in accordance with the Constitution, the Cabinet of Ministers terminates its work in the following cases: the conferral of powers to the newly elected VRU; voluntary resignation of the prime minister; the Verkhovna Rada of Ukraine adopted a resolution of no confidence in the Cabinet of Ministers of Ukraine. That is, the election of a new president does not directly affect the resignation of the government, without the influence on which head of state is very difficult to promote their will. With the abandonment of the post of Petro Poroshenko, these special changes are unlikely to happen. However, in case the president will pick up a new person, there are still several options for his interaction with the government (see below). Option 1 - the new president will be able to reform the government and appoint a nominal prime minister to parliamentary elections. Option 2 - the current composition of the government and the newly elected president will find a common language, will consolidate areas of interest and in more or less consensus will reach the parliamentary elections. Option 3 - the president and the government will enter the clinch and will resist each other. In fact, Ukraine will burgeal in the times of the presidency of Viktor Yushchenko and Prime Minister Viktor Yanukovych and Yulia Tymoshenko. By the end of November, the process of formation of state-political institutes in Ukraine will be completed. It is also worth bearing in mind that in addition to the threats posed by the elections in Ukraine, there are other dangers that will in one or another way determine the agenda for domestic political discourse, namely aggression of the Russian Federation, the war in the Donbass, the occupation of the Crimea, the Azov crisis, the need for payments for external borrowing. Decisive influence on the outlined situation may be the introduction of martial law throughout the country. The creation of the State Bureau of Investigations - a new law enforcement body with colossal powers - continues to accompany with permanent scandals from the selection of the Head of Bureau and his deputies and to the refusal of the Director of SBI Roman Truba to external competitive commission in appointing 27 people to leadership positions in the department. This battle will be strengthened in the context of the elections which create reasonable suspicions about political game between the Presidential Administration and various groups of the People`s Front for the control of the Bureau. Only the intensification of international attention and civil society can help to create at least to a certain extent a transparent law-enforcement institution controlled by the society. A new turn of run-in The cornerstone of the new wave of confrontation was the refusal of the Director of SBI Roman Truba to competition commission to consider the issue of appointing 27 people to the leading positions of the department. Truba`s argument was based on the fact that a number of candidates appear in journalistic investigations and criminal proceedings, in particular regarding state betrayal, and legalization of funds obtained by criminal means. Also, the Director of SBI has accused the foreign competition committee of unlawful destruction of the polygraph results which could give him the opportunity to assess moral, professional and personal qualities of candidates recommended by the commission and sign an order for their appointment. With that in mind, Roman Truba returned all the submissions to competition commission, before having obtained an examination of the legality of his actions by the Institute of Legislation of Parliament and Academy of Legal Sciences which, by analyzing the legislation, confirmed the legality of his actions. Instead the competition commission has already decided at the next meeting regarding reapplying of appeal to Truba for the appointment of 27 candidates for leadership positions in SBI and also appeal to the specialized parliamentary committee with a request to analyze the legality of actions both the commission and the Director of SBI in this situation. It is interesting that even before the decision of the competition commission on the recommendation of 27 people to the leadership positions of the SBI the list of “favorites of authorities” was published in media and the lion's share of them was in the final list. Most of them journalists and experts called the protege of the Minister of Internal Affairs Arsen Avakov and the Deputy Head of the National Police of Ukraine Igor Kupranz. This situation caused a negative reaction in surroundings of the anti-corruption public organizations and the Council of Public Control in SBI. Thus, the anti-corruption activists welcomed Truba`s decision on the rejection of these candidates, calling it a strong step, which gives a chance for the likely independence of SBI from authorities. At the same time, the First Deputy Director of SBI Olga Varchenko stated that the actions of the Head of Bureau are illegal because SBI is a collegiate body and decisions should accordingly be taken jointly by director and deputies. She noted that there were no complaints at all up to half of the applicants and they had to be appointed. In addition, according to the law, the commission has no right to transfer the personal data of candidates to anybody and the polygraph data in general is not a ground for refusal to appoint a candidate. That is, the polygraph was only a formal reason not to appoint candidates elected by the commission, but the main motive should be sought somewhere else. Submerged part of the iceberg In order to understand the current situation, it is worth mentioning some important points, about which we wrote in previous releases of IU. First, the election process of the Director of SBI, his First Deputy and Deputy lasted for 1.5 years. The competition commission was created according to the principle: three persons from the president, the government and the parliament. In fact, the commission includes only representatives of the political forces – 5 from the “BPP” and 4 from the “People`s Front”. Secondly, the establishment and election procedure of the SBI leadership indicates the existence of a planned scheme for the provision of external management of this body by appointing a weak leader – representative of one political force (according to media it is “People`s Front”) and the first deputy and deputy of another – “BPP”. 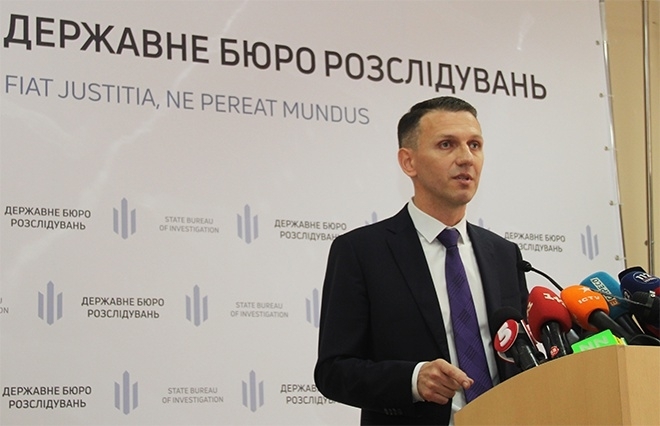 At last, “BPP” and “People`s Front” reached an agreement concerning the position of Director on which Roman Truba was appointed according to the recommendations of the NSDC Secretary Oleksandr Turchynov. Olga Varchenko (First Deputy) and Oleksandr Buryak (Deputy), who were previously working at the Kyiv Prosecutor's Office, were elected as Truba`s deputies. Moreover, the long time the establishment of SBI was the question hung in the air and the movement with the appointment of leadership of this body took place after the activation of work of new anti-corruption authorities, because the Bureau can be a good tool to fight against “too self-contained” NACB, having the right to investigate crimes committed by the leadership of both this body and the SAPO. So the current situation became a continuation of the battle of Presidential Administration and various groups of the “People's Front” for the influence on SBI. It seems that in the outlined conflict Truba defends the interests of the NSDC Secretary Oleksandr Turchynov and the MP from “People`s Front” Serhiy Pashynskyi whose proteges were rejected during the competitive selection phase, instead the candidates agreed with Presidential Administration and Minister of Internal Affairs Arsen Avakov have prevailed. The result of such a situation will certainly be the delaying of the start of work of SBI, which has been postponed from September to October. In general, this situation plays into the hands of the heads of the GPO and the Ministry of Internal Affairs, who before the creation of the Bureau retain significant powers in their hands. It is not excluded that the authorities generally decided to block the procedure for starting the work of SBI, because today it has already been possible to find a common ground with the heads of NACB and SAPO. The evidence of this is the “secret” meeting between Artem Sytnyk and President Petro Poroshenko, support from Arsen Avakov and “People`s Front” to the head of SAPO Nazar Holodnytskyi, in particular, during the consideration of his case in the Qualification-Disciplinary Commission of Prosecutors. Although Truba himtself is optimistic and plans to launch SBI in October. For this he decided to appoint, by his order, deputies of territorial units and acting heads of units of the central apparatus, who, according to him, will help to launch the work of the Bureau. The Internal Competition Commission №2 defined 14 winners of the competition for the positions of deputy directors of the territorial departments of SBI. As of September 5, Truba appointed five deputy directors of the territorial departments of SBI. But this is not enough to start the work, because the order to recruit 150 investigators has not been signed yet, and in fact, there is no one to investigate crimes. In addition, the sole appointment of deputies and acting heads of the central apparatus by Truba is questionable from the point of view of the law, which stipulates that such actions must be carried out jointly with his deputies. Roman Truba hopes that in September the Verkhovna Rada will consider a bill that partially solves the issue of appointing candidates for leadership positions and participation of the Director of SBI in this. But given the current political scenarios and the collision of the interests of the main parliamentary players in gaining control over SBI, this bill has practically no chance for adoption, as well as inclusion in the agenda. Thus, it is expected the continuation of the bidding between the main political players, the result of which will determine the future launch of SBI. There is likely to be a political consensus about maximizing delay of the work of this body. The international community and civil society should be more actively involved in the monitoring of the situation with the formation of the “Ukrainian FBI”, since the transformation of this body into another institution of political competition can obliterate all previous achievements, both in reforming law enforcement bodies and fight against corruption. Following the annexation of Crimea and the military conflict in the East, the white-blue or conventionally perceived "pro-Russian" electorate has decreased by at least 5 million potential voters, but it remains a solid part of all the voters in the country - not less than 20-25% of voters. For politicians competing for this election niche the key challenge in the 2019 elections will be the development of an updated ideological platform, their consolidation and the ability to organize and accordingly motivate their electorate. Internal squabbles and self-complacency can potentially weaken white-blue camp, while only modernization of its ideology and more active work with voters can ensure their success in the 2019 elections. “Oppobloc”: uneasy marriage of convinience "Opposition block" consists of different groups. Each of them has its own center of influence. But due to solid support in society (according to recent polls, 8.5%), these groups keep together, despite constant scandals within a single political force. "Oppobloc" is torn apart by internal contradictions. If earlier the main conflict was between groups of people's deputies representing the main sponsors - the oligarchs Dmitry Firtash and Rinat Akhmetov, now there are misunderstandings within all the groups. The controversy intensified after an unsuccessful attempt of the odious politician and Vladimir Putin's fellow sponsor Viktor Medvedchuk to enter the "Opposition Bloc". The reasons for the failure of this initiative were different - the toxic personality of Medvedchuk, the reluctance of the Bloc to let to its ranks a strong person who used to control everything, including contacts with Moscow etc. In any case his accession to the “Oppobloc” did not take place, and the "Oppobloc" is now experiencing increased disintegration processes. The most visible sign of disintegration has been establishment of such projects as "For Life!" led by Vadim Rabinovich and Yevgeny Muraev, "Christian Socialists" led by Mikhail Dobkin, together with Medvedchuk's longtime ally Nestor Shufrych, left the "Opposition Bloc". 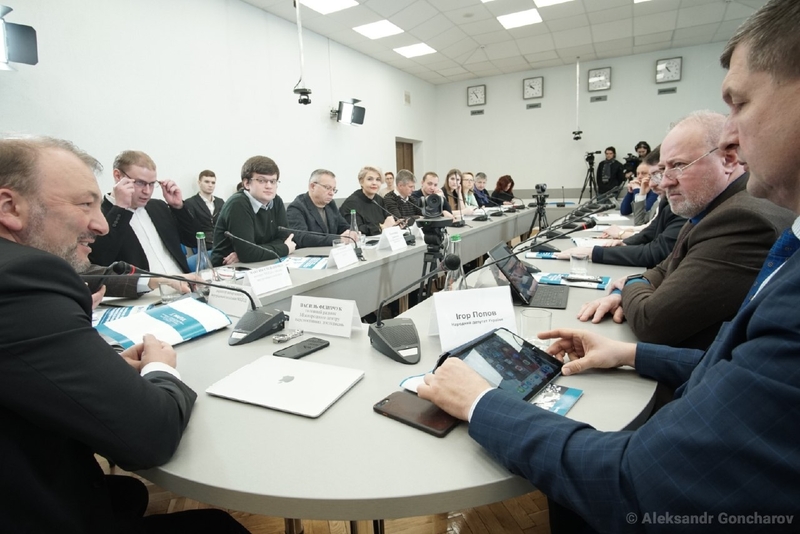 But even those who remained in faction have been preparing alternative platforms for participation in the elections: Peace Party of Vadim Novinsky, Republican Party of Yuriy Boyko, Industrial Party of Kolesnikov, Ukrainian Perspective of Vilkul and others. In their election programs representatives of "opposition forces" focus on the issues that are now of greatest concern to their voters: to end the conflict in Donbas, revise the budget to enable economic development and social justice, abolish pension reform, develop accessible and high-quality medicine and education, carry out tax reform, lower pressure on taxpayers, more incentives to revitalize the economy, create attractive conditions for investors, provide energy security of the country and ensure heating in Ukrainian homes, restore financial and economic stability, fight corruption, conduct reform of decentralization and local self-government reform, reduce tariffs etc. And if with the election slogans of the white-and-blue politicians’ positioning is more or less understandable, then the situation with the only candidate for the presidency or the parliamentary election list is much more uncertain. Yuriy Boyko has the highest rating: according to the latest polls, 8.4% - mostly voters of the East, the South and Donbas. Another possible candidate may be Vadim Novinsky supported by the Ukrainian Orthodox Church and business partners, primarily by Rinat Akhmetov. Another longtime associate of Akhmetov Boris Kolesnikov, who "manages" the oligarch's political projects, is unlikely to run at the elections, and will most likely support Novinsky. Kolesnikov has already revived his "shadow" government and will probably soon become politically more active. Despite the moderately critical rhetoric towards the government, the analysis of the "Opposite Bloc" actions allows experts to conclude that it cooperates with authorities and might lose the position of the main opponents of the current regime. In addition, such actions and moderate opposition rhetoric open a wide field for maneuvers for more radical forces - for example, "For Life!" Rabinovich and Muraev, who can take a significant part of the electorate. All this, together with internal conflicts in the faction, can deprive "Opposition Bloc" from the role of main opponent of the acting government and worsen the results at the election race. “Party of Peace” of Vadim Novinsky A potentially strong player in the white-blue electoral field will be Vadim Novinsky and his movement "Party of Peace". He can strengthen the “Oppobloc” split. Given the close relationship between Novinsky and Akhmetov, with whom they remain business partners, his group (Olexander Vilkul, Borys Kolesnikov and other "Akhmetov people") can go to parliamentary elections as a separate group. The main electoral effort of "Party of Peace" most likely will be focused on controlled areas of Donbas. Here, in addition to a fairly large electorate of the Party of Regions, Akhmetov's charitable foundation, which has for a long time and systematically worked with the population, will help them. The family of Vilkul will be able to ensure good result of the elections in the Dnipropetrovsk region. Novinsky has good chances in the Mykolaiv region, where he owns ship-building yard "Ocean", Mykolaiv machine-building factory and many other companies. It is not easy for Novinsky's party to win in the Kharkiv region, which is actively dominated by "For Life!" with the support of the Dobkin’s Christian Socialists. However, trump card of Novinsky for nearly the whole country is the support of the Ukrainian Orthodox Church of the Moscow Patriarchate. Novinsky made a good shot by naming his political project "Party of Peace". According to all social surveys, more than 40% of respondents consider the chievement of peace as the priority task. And this issue is especially actual for the residents of eastern Ukraine. Besides peace, Novinsky promises working places and care for the socially disadvantaged groups, while rigorously criticizing the current government, which increases the support of voters. “Who is whose Rabinovich?” On the background of conflicts within the "Oppobloc", the party of Vadim Rabinovich and Yevgeny Muraev "For Life!" is rapidly gaining popularity. According to the latest social studies, 8.1% of Ukrainians support it. Although both parties are of pro-Russian nature, they have financial and personal contradictions. Thus, they are unlikely to choose a single candidate for the presidential election. Vadim Rabinovich will obviously run for the elections separately. He is now supported by 5.5% of voters. He divides his main electorate with Yuriy Boyko - in the East, South and Donbas. Rabinovich tries to position himself as a "third force": he did not hold high government posts and, like many Ukrainians, is dissatisfied both with opposition and with the authorities. He blames the authorities for inefficiency, economic crisis, decline in the living standards, and the opposition - in flirting with authorities and lacking a constructive position. In foreign policy, he advocates Ukraine as "Switzerland of Eastern Europe", in other words, he supports the ideas of neutrality and independence. After leaving “Oppobloc” Rabinovich has strained relations with Sergyi Lyovochkin. Politicians continue to exchange compromising materials, accusing each other of the game in the interests of Bankova. "For Life!" and "Oppobloc" today are fierce competitors in the white and blue camp. Since both parties have a rather high rating, they are unlikely to unite before the elections, although under Moscow's pressure this option is possible. Inside the party "For Life!" there is also no agreement and trust between its founders. Muraev does not like unipersonal PR of Rabinovich and the way his is making decisions without consulting with his partner. Muraev even suspects Rabinovich in obtaining funding from Bankova. He is also against the split of the opposition camp. The situation is still not critical, but, nevertheless remains rather intense. One can not help noticing the rapprochement of the party "For Life!" with Viktor Medvedchuk. Nestor Shufrych, Medvedchuk's loyal associate who left “Oppobloc” has joined Rabinovich's political project. The truth is, however, that Shufrych has not left the faction yet not to lose the mandate of the MP. Medvedchuk is advantegous for Rabinovich. He has serious financial resources, and also, he can create a good PR on the topic of war through close ties with the Kremlin, for example on the issue of the hostage release, and so on. The phenomenon of Murayev and Rabinovich is not so connected with media resources and significant investments of Medvedchuk, rather as with the fact that they took on a radical critique of the government. By doing so, they can get ahead of "Oppobloc" which is more playing at giveaway with Bankova than really criticizes it. In its current form "Oppobloc" is more a part of the ruling establishment than the opposition to it. All this can lead to significant losses in their rankings while their electorate being taken away by more radical and determined political forces from the white and blue camp. “Osnova” of “technocrat” Taruta Partly Serhiy Taruta and his party "Osnova" will fight for the votes of the white and blue group. He and his party declare themselves as a constructive opposition to the system of state power in general, while offering alternative ways of development for the country. This party favors the idea of liberal market: state non-interference in the economy; maximum freedom of trade and competition; individuals are responsible for their own destiny, however important issues for the whole society should be resolved together; the government is equally distant from all religious confessions. The party leader positions himself as a technocrat, and his associates as people of action. The frame of his party consists of those who worked for serious positions under former President Yanukovych - Andriy Nikolayenko, former chairman of the Kirovohrad RSA, Yaroslav Arsiriy, deputy minister and director of the department in the Ministry of Culture and deputy chairman of the Kirovograd Regional State Administration, and Volodymyr Polochaninov, ex-deputy from “Batkivshchyna”. Taruta is a frequent guest on TV with his party being actively advertised on billboards. Serhiy Oleksiyovych tries to present his power as a progressive, liberal, non-populist and intelligent "third force". "Osnova" tries to play on two electoral fields. Reported ideas are closer to the liberal-democratic camp, but personalities are more understandable for the white and blue electorate. Taruta criticizes the Minsk process and Kiev policy for reintegration of Donbas. As for now neither Taruta nor his party have sufficient rating. "Technocrat" Taruta is looking for more influential allies. He has good relations with oligarchs Victor Pinchuk and Rinat Akhmetov, in politics - with Yulia Tymoshenko. Experts even discuss a possible alliance under the format of Tymoshenko being the president and Taruta - the prime minister. Prospects for such cooperation are rather dubious. But Taruta, obviously, may be useful for Tymoshenko in her struggle for the presidential post, for example, as an antagonist to Anatoliy Hrytsenko. “Our Land” (“Nash Krai”) "Our land" will also fight for votes of supporters of the white and blue. Vitaliy Kovalchuk, deputy head of the presidential administration, was engaged in its creation at one time. "Our land" basically includes former non-disbursed deputies of the "Party of Regions" "(Anton Kisse, Olexander Feldman and Sergiy Kaltsev) who position themselves as managers and patriots of their small homeland. “Our land” does not have traditional ideology and can be hardly connected with either right or left political forces. It focuses on local issues planning to raise public support among voters for whom a beautiful school on a nearby street or an asphalted road is a top priority. Representatives of “Our Land” as a rule are loyal to the authorities, but at the same time adhere to moderately oppositional rhetoric in order not to lose the white and blue electorate. The given party has a number of problems. First, Igor Kononenko and Vitaliy Kovalchuk compete for control over it under the entourage of Poroshenko. Secondly, the party does not have a charismatic leader, therefore it will not probably reach the national level. Party “Revival” (“Vidrodzhennia”) Another political project, which publicly claims its opposition nature, but in fact, plays in favor of authorities and can take the votes of supporters of the white and blue is the party "Revival". Like "Our land", this party became a shelter for deputies from the Party of Regions who did not want to associate themselves with the former beneficiaries of the Party of Regions - Lyovochkin, Akhmetov, etc. The most well-known people in the "Revival" are Viktor Bondar, Anton Yatsenko, Viktor Ostapchuk, Volodymyr Pylypenko and Vitaliy Khomutynnyk. The main political messages of the party are limited to economic reforms (proposed introduction of the principle of economic nationalism) and changes in the taxation system. The party wins from having a deputy group in the parliament, but obviously loses in support of the population. In the upcoming elections, the "Revival" will bet on majoritarian candidates, while Bankova can help it with financing through the state budget. “Left Opposition”: risen from the ashes Among the white-and-blue electorate in the East and Donbas there is some support for the movement "Left Opposition". The given all-Ukrainian public association of left and center-left forces consists of five parties and 13 civic organizations. It is headed by the leader of the forbidden Communist Party, Petro Symonenko and his colleague, prominent veteran communist Georgy Kryuchkov, leader of the Progressive Socialist Party Nataliya Vitrenko, former director of the Ukrainian Institute of National Remembrance Valery Soldatenko, as well as athlete Rudolf Povarnitsyn. After the prohibition of the Communist Party of Ukraine and the collapse of the SPU on the left ideological flank, there emerged a vacuum, which the left-wing politicians would try to fill up with "political insurgents". The rhetoric of their "Left Opposition" is marginal, being pro-Russian and anti-Western. They call the revolution of dignity a coup d’état, after which Ukraine lost economic and political sovereignty. Normal development of Ukraine is possible only together with Russia and Belarus while the course towards Euro integration will lead to the degradation of the Ukrainian state. Thus, the movement "Left Opposition" proclaimed its purposes to be the restoration of good relations with Russia, the entry into the Customs Union, the recognition of Russian as the second state language. Using such a rhetoric, this political project will probably not receive many votes, but nevertheless will be able to take a certain percentage of votes from the “Oppobloc” and “For life!” The struggle between the opposition white and blue forces is disastrous to them and plays in the favor of Bankova. It is very important for President Poroshenko not to allow a single candidate for this part of the electorate. It is advantageous for him that they go apart and compete with each other. Poroshenko is also advantageous to play the scenario in the second round with a sparring partner Boyko or Rabinovich. When Ukrainian voter is offered a choice between two evils, Poroshenko will look obviously better and it is unlikely the voter will now choose a candidate from the white and blue. Despite the conflicts in the white and blue camp, the politicians who represent it are distinguished by some discipline, which is primarily based on the economic interests. Therefore, it is likely that most of the white and blue, including Novinsky and Rabinovich, will support Yuriy Boyko in the presidential elections in 2019. Others have weak ratings. Taruta, with his "Osnova", will most likely speak on behalf of Tymoshenko. Dobkin will act in the way Medvedchuk will direct him, and the new old "left" will move in the direction indicated by Moscow. In general, the white and blue politicum is a reflection of several oligarchic groups. First of all, there are big groups of Firtash-Lyovochkin-Boyko and Akhmetov, as well as small groups of Pinchuk and Kolomoisky. It is these shareholders who decide everything and determine the architecture of the relationship between the political groups and forces under their control. There is great controversy between these shareholders, as they cannot agree on distribution of their place in the Ukrainian economy, or concerning the person who should be the president - the arbiter in the relationship between the oligarchs and the guarantor of the implementation of the agreements reached between them. In addition, Poroshenko is able well enough to play upon differences among them. Previously, he clearly dented the position of the strongest oligarch after the Revolution - Igor Kolomoisky, while others are now precarious to enter into direct confrontation with him. All this is extrapolated directly to the white and blue opposition politicum, which is very versatile and unlike Tymoshenko, Hrytsenko and other politicians, has not decided the format for going to the elections (single candidate or several, united political force or several different). They could be an alternative to the current government, but because they are scattered and do not show proper activity, unlike the others, it may happen that in the second round of the presidential election they will not oppose Poroshenko, and there will appear completely different political figures. As a result, the situation may emerge when "Oppobloc" from the main opposition of the current government will turn into outsiders. And this will be the price they will pay for failure to negotiate, for targeting not the voter, but the sponsors and the expectation that they will win on the wave of dissatisfaction with the authorities, which, however, can currently pick up other players. ICPS will start accepting applications for participation in the project "Integration of Internally Displaced Persons into local communities. Workshop program in Germany"
The International Center for Policy Studies, in cooperation with Cultural Vistas (Germany) and with the support of the German Ministry of Foreign Affairs, is launching a project to support Ukrainian activists and experts involved in the integration of internally displaced persons (IDPs) in local communities in Ukraine. To this end, 13 participants from different regions of Ukraine selected on a competitive basis will attend a six-day training course in Berlin where they will have the opportunity to improve skills of promoting the integration of IDP into local communities. Since 2015, Germany has been actively testing various initiatives to improve the integration of migrants, many of which are based on cooperation with local or regional organizations and the commitment of individuals to help migrants to adapt to new environments. At the same time, Germany faced a wave of negative perception, which caused many misunderstandings and cultural stereotypes. To minimize the effects of such trends, civil society representatives have been actively involved in Germany to support "newcomers to society", regardless of their native region of origin, political preferences, religion, etc. In order to exchange experience on this issue, ICPS initiates a training program for Ukrainian colleagues. Participants will be able to get acquainted with the experience of German colleagues in overcoming the perceptions, stereotypes, misunderstandings, and to develop their own decisions to improve the integration of IDP taking into account the Ukrainian context. In addition, the curriculum provides for the study of the German reunification model of 1990-1991 and the implementation of decisions aimed at bringing together two socio-political cultures (East and West Germany) of that time. Duration of studies in Germany: September 24-29, 2018 Upon returning to their communities in Ukraine, participants will have to organize events involving the IDP and representatives of host communities to discuss their experience and find ways to overcome the challenges faced by IDP in Ukraine. Language of training: English, German. Synchronous translation into Ukrainian is provided. Transportation costs as well as living expenses are covered by program sponsors. In order to participate in the project you need: - to be involved in the process of integration of the IDP in the local community; participate in projects aimed at improving the integration of the IDP; to be actively interested in and explore this issue; seek to improve the situation with the interaction of the IDP and host communities in Ukraine; - to speak English at the basic speaking level; - have a valid biometric passport. 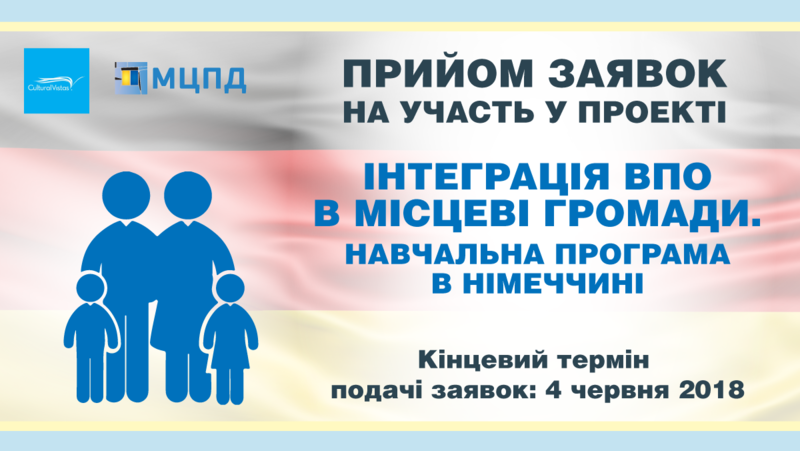 Otherwise - the participant will have to undergo the procedure for obtaining a German visa on his or her own; - send a resume and a motivational letter justifying your interest in the program and describing the relevant experience by e-mail office@icps.com.ua. Limitations on participation in the program: civil servants and representatives of local authorities cannot be participants of the project. Deadline for submitting applications is June 4, 2018 If you have any questions, do not hesitate to contact us: +38 044 253 52 29; +38 068 194 94 04.